Last year we introduced the 15ml’s which was immediately a big succes during the festives. It was to be expected in a beautiful box combining several fragrances. The first combination with the fresh and clean Muschio Bianco (White Moss), alternated with the spicy Black pepper & Sandelwood and ofcourse the classic ACCA KAPPA parfum – 1869 [ordernummer 1256]. When you are a big fan of Muschio Bianco, and you want to alternate with Giallo Elicriso or 1869, then this larger box might be something for you [ordernummer 1246]. When satisfied with the Muschio Bianco and not really looking for new parfums then you will also like the colection of body care. A nice gift box with a caring for a sensitive skin shaving foam and soap [ordernummer 1254]. Please note! In the perfum boxes there is only the eau de parfum available and for the caring kit we have an eau de toilette. 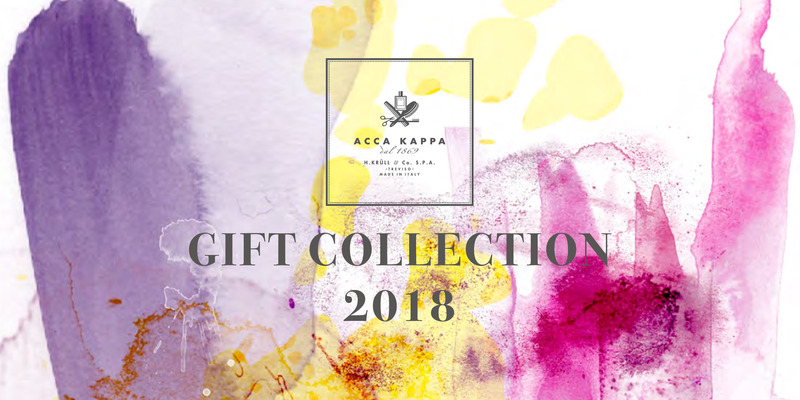 With almost 150 years of experience we also have some ACCA KAPPA classics! You might not miss the refined hand soaps in these nice giftboxes, we have several fragrances of 100 gr en they are full with essential oils. Real nice soft soaps to refresh your hands [ordernummer 969]. Still favourite among youngsters is the Green Mandarin line of ACCA KAPPA is de Green Mandarin-lijn. This invigorating fragrance combines a nice 500ml showergel and a 300ml body lotion which shouldn’t be missed to enlighten your darker days in the winter [ordernummer 959]. Muschio Bianco or White Moss, together with the 1869-line the ACCA KAPPA fragrance. How can you combine this line better than with one eau de toilette, soap, handwash and a deo [ordernummer 1267]. Or even better?! Fragrance your house with this soft and clean Muschio Bianco with the 250ml room diffuser (incl. 500ml refill) [ordernummer 1226]. Did you know….. that when you are using a bar of soap you are using up to 7 times less soap then instead of using a handwash in a pump?! So a great gift for those who care for the environment. Besides these die hard toppers ACCA KAPPA introduces also a couple of new giftsets, among which boxes with brushes for your hair. The luxury travel paddle brush, is made out of kotibè wood,combined with products for damaged hair [ordernummer 1273]. A luxury box for the man with the beard?! Those who have a beard should mantain, a very nice box containing a beard brush made from wengé to last long, beard shampo0 (200ml) and a beard fluid (50ml) for the finishing touch [ordernummer 1203]. If you want to have a need and fresh face a perfect gift will be the black shaving set, made out of a refined nylon (we care for the animal suffering) and a mach 3 razor [ordernummer 609NS]. Did you know…. the shaving razor of ACCA KAPPA uses the formidable Mach 3 system, so replacement is easy as you can buy those on every corner!